Kris and I started playing the Layton games after we beat the Ace Attorney series and wanted more. There are three wolves and three chicks, all who need to get to the other side of the river. Only two can go on the raft at once and there can never be more wolves than chicks on one side or else the wolves will eat the chicks. This a trial and error type puzzle and it can get annoying depending on how long you’re working on it, but it’s fun all the same. Just like the one above, you have three glasses that hold a different amount of liquid. You need to pour the juice in all the cups to get a certain amount. Trial and error. You’re a detective taking statements from witnesses. All but one are lying. You need to deduce their statements and figure out who is telling the truth. I like this logic, process of elimination type riddle. Similar to Five Suspects, you need to sit six brothers at a table together. They’re all arguing with one another so one can’t sit next to two and two can’t sit next to four, and so on. It’s fun to follow the clues and figure out the correct seating arrangement. I remember doing these kinds of puzzles in school when we had a substitute teacher. You need to create a picture using only one line, not lifting your pen off the paper. It’s simple, yet challenging. What are some of your favorite puzzles? Wolves and Chicks is a memorable one for me, as are all the ones you mentioned. I remember spending a lot of time with the block puzzles near the end, though that was probably not by choice, haha. I like some of the matchstick puzzles where you take one away and form a different word. I’m a fan of the trick puzzles where the answer is the least expected one, like one where the person giving the puzzle is actually the answer. It’s been so long since I’ve played the series, but those are the ones that stand out to me. The matchstick ones are a pain for me, lol. Some are easy, but a lot of the time I think it’s obvious and I’m way off. The block puzzles are very difficult for me, though I do enjoy them. They’re a nice challenge. I find the juice pitcher puzzles very frustrating. I always seem to forget which actions I have taken so I end up with the same amount of juice in each pitcher. 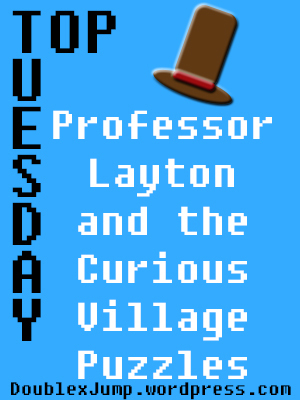 I love the Professor Layton series. I end up doing the exact same thing. Watching my sister and I do it together though is pretty funny, lol.